In our last post we talked about goal setting and how planning ahead saves you time and will help you be more productive. As we mentioned, attending conferences and workshops demonstrates commitment to continued education and personal growth. According to IBISWorld conferences and trade shows are a $13.8 billion industry. 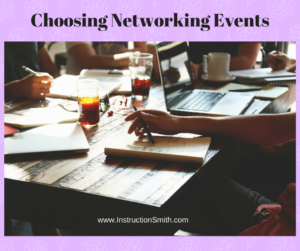 Since attending networking events is such an extremely effective way to connect with people in person and enables you to meet large numbers of people in a short period of time, we thought we’d share some information about how to make sure you pick the venues that best serve your interests and help you reach your goals. Choose conference(s) that will help you meet your goals. Attending conferences and networking events can take a lot of time and cost a considerable amount money so make sure when you attend these events that they align with your business and will help you meet your goals. What is it you are looking to learn or come away with? Do you intend to connect with people you’re hoping to hire or work with? Or are you there to research other brands or businesses? Are you interested in meeting the speakers? If so, make sure the speakers are in line with your industry. Is the conference right for you? If you’re an introvert like Michelle you might want to stick to some of the smaller conferences. This will give you the opportunity to mingle and get to know other attendees on a lesser intimidating and overwhelming level. Know how much you can afford. Some conferences cost a considerable amount of money. Find the conference or combination of conferences that works best and will offer you the most benefits. Research and take into consideration all travel, lodgings and meal expenses. Research the other attendees. These events are great networking opportunities if you want to meet new people and connect or re-connect with a specific audience. I think most conferences publish a list of both speakers and attendees. Look at the list of sessions in advance and create a schedule of the ones you’re most interested in attending. As often as possible seek out and talk with other people in the industry who have first hand knowledge and are willing to offer advice and share their perspective. It is important for you to get as much feedback as possible on what works and, more importantly, what doesn’t. Know where you are in your career. If you’re just starting out it is important for you to make as many connections as possible. Get out and network and meet and talk to as many new people as you can. The longer you are in business and once your business is established you can become more selective about events you choose to attend.